In all, the duo compared DNA from 77 redpolls, including specimens from museums around the world, from the Museum of Vertebrates at Cornell University to the Natural History Museum of Geneva in Switzerland. They found no DNA variation that distinguishes Hoary Redpolls from Common Redpolls. Furthermore, another redpoll species found in Europe—the Lesser Redpoll—also had extremely similar DNA sequences. This extreme similarity among all the redpolls stands in marked contrast to studies of other groups of birds—such as Black-capped and Carolina Chickadees—which show differences at many regions of the genome. Should we be getting out the eraser for our checklists to reluctantly eliminate a hard-earned tick? Will the lumpers win out? We’ll find out when the American Ornithologists Union’s Nomenclature Committee reviews the eventual proposal from the study’s authors. Stay tuned! Hmmmm… what puzzles me is that they found intermediate birds. I’ve seen my fair share of Lesser Redpolls, Mealy (Common) and Arctic (Hoary) Redpolls here in Europe, and not once did I see an intermediate bird that I could not definitely assign to one of these taxa. I have also never seen photographs of “intermediate” birds that cannot be assigned to one of the forms. The examples they show in their publication (the five pics in a row) also do not show any “intermediate” birds – clearly the two on the left are Common while the three on the right are Hoary. I remember a decade or so ago, a genetic study showing no significant distances and a field study confirming that Lesser and Mealy overlap in southern Norway without interbreeding really messed up the taxonomic debate. I guess the answer to what the Redpoll taxa really are lies in the breeding grounds of the high Arctic. Unless we have a detailed and comprehensive study “up there” about distribution, overlap and mixed pairs or assortative mating, we won’t know for sure. I’ll do it, just give me plenty of money! Hi Jochen – good points, however be aware that the 5 pictures in a row you mention are not part of the scientific publication and were assembled only to be generally illustrative. I’d encourage you to click through to the paper itself to read the details of the study. Much of the work was done with DNA samples from museum specimens taken from across their range—and the genetic analyses shows them pretty thoroughly intermixed (as the tree diagram shows in the post). It is still a fascinating puzzle why the three forms do appear so distinct much of the time, but it does not appear to be due to DNA. As one of the authors says, it makes the redpolls even more interesting of a species for him. Personally I’d love to go along with you on that comprehensive study of whether there is assortative mating in the High Arctic! Regarding the redpolls, I think a proposal to lump them might be a bit hasty based on the DNA data alone. Especially as redpoll taxonomy is such an interesting current subject, with so many open questions, and lumping sadly would ensure that birders would lose interest in differentiating between the taxa and a (potential) wealth of data on the taxas’ movements and distribution would be lost. I spent 6 months in Alaska 20-21 years ago and I’m quite positive I saw both Hoary and Common Redpolls, but I could only bring myself to tick Common. To me, there was simply too much variation among the scores of birds I was seeing. After much study, I never bought into the two separate species. Granted, I’m not the best birder on the planet, but that’s how I saw it. In the later 90s I communicated with someone from the Midwestern US on the subject, and he more or less echoed my sentiment. Despite numerous articles on differentiating the two I still felt they were hard to pin down in absolute terms. I looked at the great variation among Song Sparrows up and down the west coast of the US and Mexico… all one species. Red-tailed Hawks haven’t been split into a number of separate species. And the variation amongst Broad-billed Hummingbirds is enormous – in late summer I want to break those dudes into about 200 different species. Who knows what the future holds, but I would be surprised if they were not lumped. So I have Common from Alaska, and due to the split Lesser from New Zealand (thanks to the 1862 introduction of birds of a known origin). Maybe I’ll be lucky and won’t have to go running off to find Hoary sometime in the future. I’m fairly sure that ebird records one species as two for me, due to me having seen a redpoll in NZ and the UK. Apologies in advance for this rather long reply… I guess I’m excited to find that others are thinking about this issue! Toward the end of the article referenced, the author, Jesse Greenspan, lists three characteristics differentiating Hoary Redpolls (Carduelis hornemanni) from Common Redpolls (Carduelis flammea): 1) living/breeding regions; 2) degree of chest & flank streaking versus whitish plumage; 3) bill size & shape. 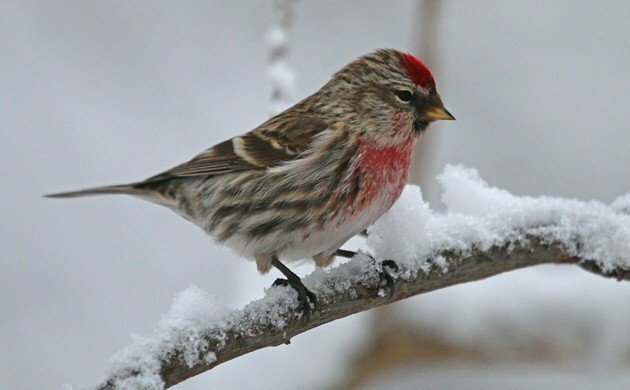 In his field guides, David Sibley notes a fourth difference: At 5.5 inches versus 5.25 inches, (14 cm v. 13.3 cm) Hoary Redpolls are, on average, larger than Common Redpolls. Although this works out to only a 9.5% difference in length, in terms of volume, a 5.5” bird can be quite a bit larger than than a 5.25” bird. A case in point would be Black-capped Chickadees compared with Pine Siskins – species which often share the same backyard feeders and can readily be observed together. The 5.25 inch (13.3 cm) Chickadees look enormous compared to the Siskins, even though the Siskins are only a quarter of an inch (0.6 cm) smaller. Before we lump C. hornemanni and C. flammea together, I’d like to see more research. There is value in separating out strains of animals – even when by broad biological definitions they are of the same species. For example, it is now well documented that not all Oncorhynchus mykiss (Rainbow Trout) are the same – that specific strains are adapted to specific waters and often cannot thrive in other waters. (And, conversely, when a strain of O. mykiss is extirpated from a given river system, other strains may fail to thrive when introduced as replacements). Leaving aside the likelihood (or unlikeliness) that one gene is controlling the above seven phenotypic traits, the last three differentiating characteristics deserve our attention as we continue to monitor climate change. If C. hornemanni can help us track the impacts of warming (both the temperature rises and the change in nesting habitat that might accompany those changes), we should be thinking carefully about what benefit there is, if any, in lumping this bird together with their close cousins. Distinguishing the two species of redpolls is an important part of my own studies. Here in Chignik Lake, Alaska, both C. hornemanni and C. flammea are wintertime visitors. C. flammea is present throughout the year. C. hornemanni appears only in wintertime, and, it seems, mainly when temperatures really drop. Perhaps in the not-too-distant future, C. hornemanni won’t visit here at all – a point that won’t be of much interest if we’ve lumped all redpolls together. In addition to fairly extensive field observations of these birds, I have good photographs. In one particular photograph, a Common and a Hoary are side-by-side in the same posture. They look for all the world like different birds… as much so as, say, Oregon versus Slate-colored Juncos and perhaps more so than the various North American Fox Sparrows. Black-backed Woodpecker to Get Protection in California?